Kayangan Heights (KH) is an exclusive, low density bungalow residential development located in the exciting growth corridor of Shah Alam with easy access via major highways. It is only minutes from schools, shopping centers, hypermarkets and international golf courses. 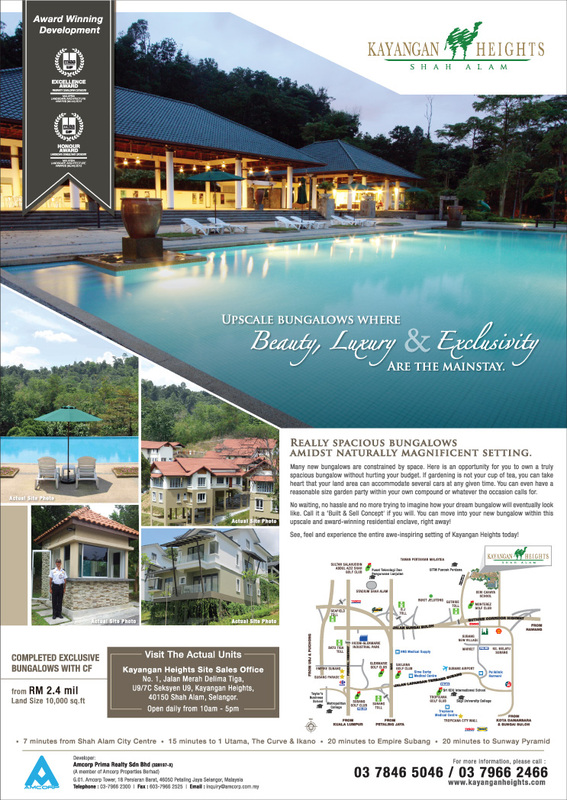 Kayangan Heights, spread across this natural environment with several precincts of bungalows, is a low density residential development, complete with tropical forest landscape and all built in harmony with the contours of the land. 24-Hr security monitoring systems including roaming patrol units, perimeter CCTV link to security station and perimeter fencing. Kayangan Heights is located within Shah Alam, the capital city of Selangor and is only about 10 minutes drive from its town centre. Shah Alam is a planned city conceptualized on well laid out plans with parks, recreational facilities, shopping, educational on social facilities and other amenities. Clubhouse facilities include gym, swimming pool and cafeteria.